Various locations in Dowtown, Vancouver, Canada. 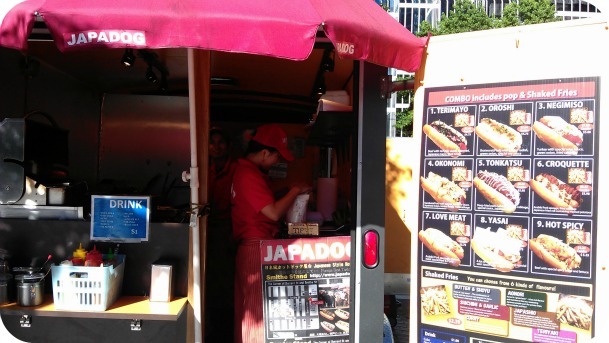 Alan and I stumbled on Japadog and ate there twice without ever looking it up and mapping it out. Our first day there we had just eaten lunch and did a few errands (Yes, you read that right. Errands on vacation! 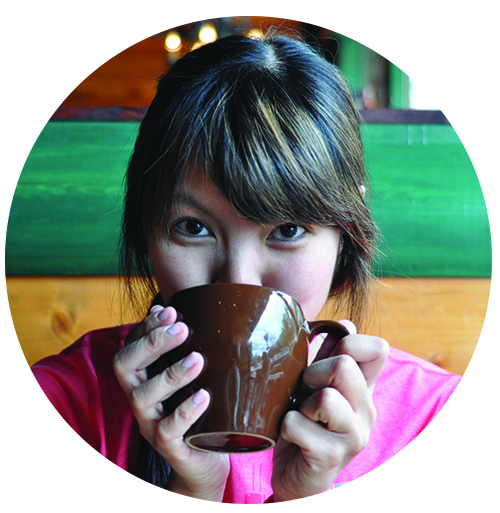 ), when we stumbled on our first of two run-ins. We had just eaten and were going to eat dinner with friends soon but couldn’t help but at least snack on Japadog, aptly named for the fusion of Japanese condiments and hot dogs. So we shared the Terimayo (Menu items are numbered differently per food cart). 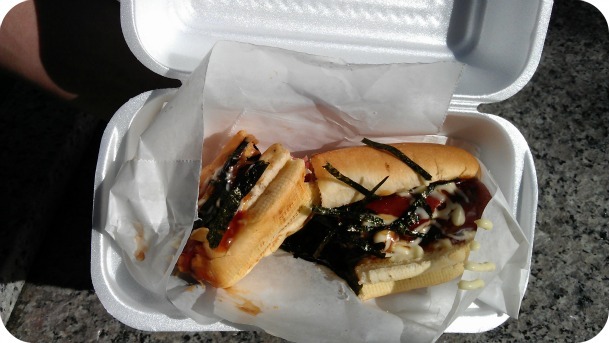 Hot dog topped with Japanese Mayo, Teriyaki sauce and seawood. It was a delightful first experience. Alan and I both made involuntary and very attractive grunts of joy. The dog was good but the toppings were an experience I couldn’t wait to have again. I’m a big fan of nori (dry seaweed) and can snack on the nori on its own. 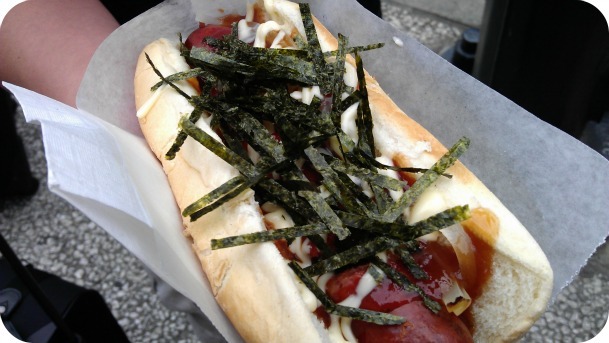 Topped on a hot dog, it gives the dog a dainty aspect. The feather light crisps of seaweed together with the smooth mayo and Teriyaki sauce and juicy dog, it’s a joy that needs to be revisited. And revisit we did! 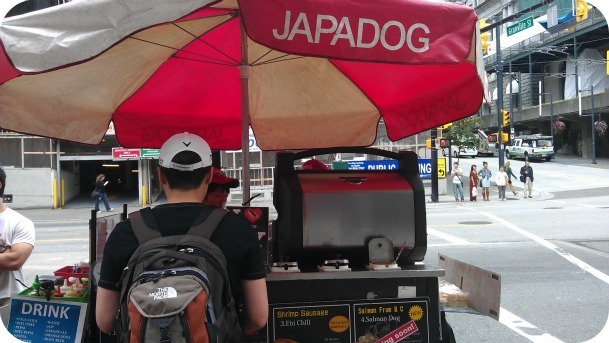 Our last meal in Vancouver, we stopped by another Japadog food cart at the train station and got two more dogs. 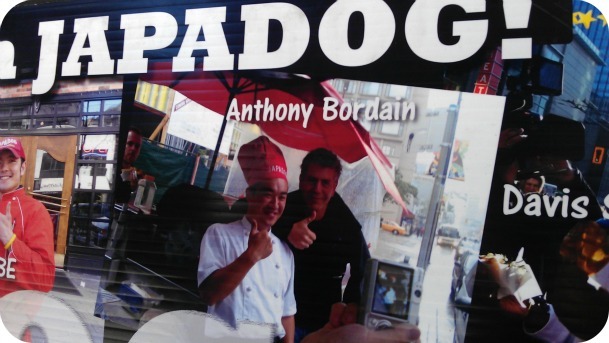 I also caught Japadog on the Vancouver episode on No Reservations. It tickles me greatly that they misspelled Bourdain’s name on their cart. 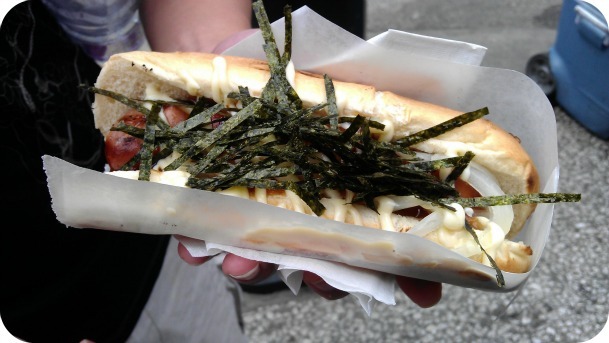 I won’t ever forget you, Japadog. The next barbecue I get invited to, I’m bringing the mayo and nori!